"...very highly recommended for personal, professional, community, and academic library Agricultural Studies reference collections in general, and Grape Disease Control supplemental studies reading lists in particular." Grapes are the most widely planted fruit crop with 7.5 million hectares grown throughout the world. They are also one of the most management intensive crops in existence. Couple this with the fact that a comprehensive diagnostic and pest management guide for grape crops has not been published by APS since 1988, you have a book that is in very high demand. 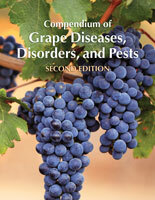 The much anticipated Compendium of Grape Diseases, Disorders, and Pests, Second Edition meets those demands and more. This unique book fills an important need by wine-, table-, and juice-grape vineyard managers, their staff and consultants, as well as the researchers, extension agents, and diagnosticians who are all working in tandem to ensure these delicate crops make it safely through the growing season. This book is packed with information to help users combat most diseases, insect pests, and abiotic disorders (weather-related damage, etc.) found in grape vineyards worldwide. And this book is truly applicable worldwide. More than 79 authors from 12 countries and 5 continents were recruited to update or prepare new sections. Part one covers diseases caused by biotic factors. It particularly addresses commonly occurring diseases caused by fungi and oomycetes, bacteria, phytoplasmas, viruses and viruslike agents (including nematode-transmitted viruses), and nematode parasites of grapevines. Part two discusses mites and insects that cause disease-like symptoms in grapes. Coverage includes leafhoppers and treehoppers, mealybugs, thrips, and much more. Part three discusses disorders caused by abiotic factors, with special emphases on chimeras, environmental stresses, nutritional disorders, the various causes of shriveled fruit, and pesticide toxicity. Part four offers two new sections that will help users save money and minimize pesticide use. The first, Grapevine Fungicides, discusses fungicides and cultural practices in the context of minimizing disease resistance. The second, Spray Technology for Grapevines, which emphasizes cost saving techniques and practices, helps users minimize pesticide use and ensures the chemical hits its target, not elsewhere in the environment. In addition, the Compendium of Grape Diseases, Disorders, and Pests, Second Edition, includes an introduction that provides helpful overviews of the grape plant, its worldwide cultivation and varied uses, its history, rootstocks, morphology, and developmental stages. 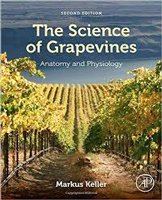 Appendices include an updated list of common grapevine disease names caused by microbes, nematodes, and viruses; as well as a guide to the many equivalent names given to grapevine diseases and disorders in the English, French, German, Italian, and Spanish languages. 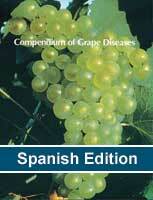 An expanded glossary of more than 800 terms used in the book, as well as a comprehensive index to make this resource accessible to anyone working in the grape industry, including diagnosticians, extension specialists; consultants; scientists; vineyard managers and staff; juice, fresh fruit, and raisin producers; and students.